Let’s think technical for a moment. A properly exposed image is created by mixing three key elements, known as the Exposure Triangle—Aperture, Shutter Speed and ISO—to produce the right amount of lightness and darkness for a photograph. There are almost endless combinations that can be used to achieve an equivalent exposure. Leaving your camera in full auto mode will usually guarantee a perfect exposure, but not necessarily a perfect image. To be creative, a photographer decides how much of each element’s value to use based on the element’s purpose. Think in terms of numbers. A value of 10 can be achieved by adding 2+5+3. An equivalent value of 10 can also be achieved by subtracting and adding 8-4+6. The same can be applied to exposure. An exposed value of f/8.0 at 1/15 sec with an ISO of 100 is equivalent to f/2.8 at 1/125 sec with an ISO of 100. Changing to this equivalent exposure produces a shallow depth of field, causing the background to blur, drawing attention to the subject. Each element has its own special purpose, giving photographers the tools they need to be creative. To use these tools to their fullest advantage requires that photographers understand the purpose of each element and memorize each of the element’s units of measure. An aperture can add creativity to a photograph by blurring the background, or tell a story by bringing everything in focus. Aperture is measured in f/stops, with each stop being equal to 1 stop of light. Notice every other f/stop is doubled, producing 2 stops of light. A shutter speed’s purpose is convey a sense of time. Using a faster shutter speed will freeze motion, making time appearing to stop. A slower shutter speed creates motion in an image, producing a feeling of action. 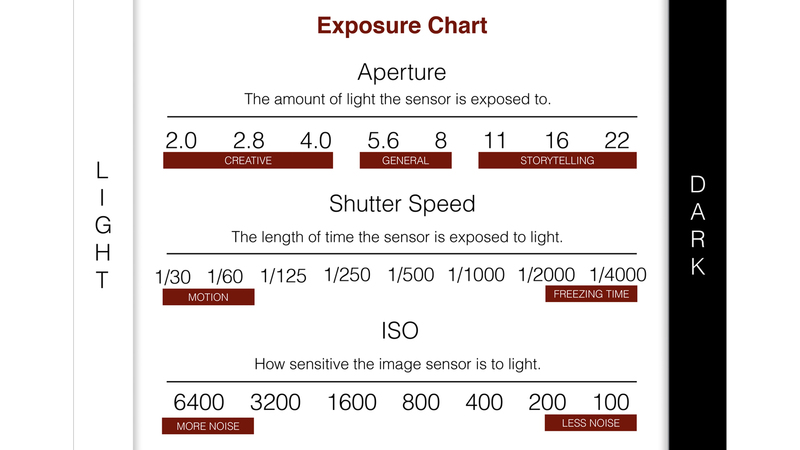 Shutter speed is measured in seconds and fraction of seconds, producing 1 stop of light. Notice how every value is doubled. A high ISO, such as 3200, will introduce digital noise to an image. Keeping the value at your camera’s native ISO setting—usually 100—will produce the cleanest image possible. Most photographers only change ISO when it’s absolutely necessary. Each ISO value is doubled from the previous value, producing 1 stop of light. The secret to achieving a proper exposure is to lock down two of the three elements and only change one at a time. Determine which two elements are most important for the shot and set them first. Once set, adjust the third element until a proper exposure is achieved. Photographing a sporting event in a poorly lit gymnasium or field is a good example. You may lock your aperture at f/2.8 to allow for the most amount of light to enter your camera plus isolate the player. Now you have to make a decision: Would you rather have a blurry photo due to a slow shutter speed or a photo with digital noise? Setting your shutter speed to capture the action at 1/1250th of second will freeze the action. This leaves ISO as your final element. Adjust your ISO to a higher value—usually 3200 for this situation—until a proper exposure is achieved. You had to sacrifice a noisier image for an image free from too much motion blur. Harder example: f/5.6, 1/500 sec, ISO 200 is the same as f/11, 1/60, ISO _____. 1/500 – 1/250 – 1/125 – 1/60 = 3 stops lighter. 1 stop darker is needed for a proper exposure. Answer: f/5.6, 1/500 sec, ISO 200 is the same as f/11, 1/60, ISO 100.
f/8, 1/1000 sec, ISO 200 is the same as f/_____,1/125 sec, ISO 100.
f/4 @ 1/30 sec, ISO 100 is the same as f/8, _____ sec, ISO 1600.
f/22 @ 1/60 sec, ISO 100 is the same as f/_____, 1/500 sec. ISO 400.
f/11 @ 1/250 sec, ISO 800 is the same as f/5.6, 1/125 sec, ISO _____. f/2.8 @ 1/4000, ISO 1600 is the same as f/8, _____ sec, ISO 800. So, how did you do? You can check your answers by downloading the answer key along with the Exposure chart. Downloaded the answer key, but it wouldn’t open. I think I got them all right though. The file should have been a PDF. The new link has been added to the article. Check your answers and let me know how you did! What on earth is a gdoc? It looks like gobbly gook when you open it up in Word. This misinformation is still circulating around!